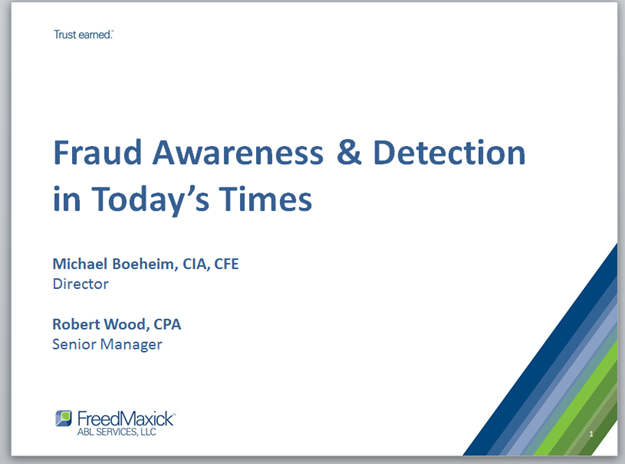 Mike Boeheim, CIA, CFE and Director at Freed Maxick ABL Services’ recent presentation at the CFA Professional Development Program Fraud Awareness Program Workshop was a smash hit. We’re pleased to offer a complimentary copy of this valuable resource. Mike’s presentation also includes a 5 step approach to fraud detection and 7 “must have” fraud prevention strategies – great information for any asset based lender. Simply complete and submit the form for an immediate download.